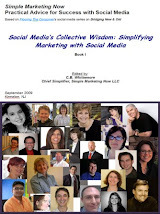 Kinnelon, NJ – Christine Whittemore, chief simplifier of Simple Marketing Now LLC, has been elected to the board of directors of the Columbia Business School Alumni Club of New York [CBS AC/NY] for a one year term expiring May 2010. She replaces Geoffrey Southworth CBS ’74 for the final year of his term. Whittemore ’93 joins Mary Reilly ’93, Craig Evans ’81, Penny Hammond ’02, Stephane Goldsand ’01, Dan McCarthy ’87, Rafael Rodas ’05, Joe Pucci ’05, Edward Rashba ’04, Frank Graziano ’82, Deborah Sanders ’91, Stacy Gilstrap ’04, Bruce Crawford ’86 and Andrew Fellingham ’04 on the CBS AC/NY board of directors. Candidates for director positions are selected from club members who have been actively involved in club operations and graduated from Columbia Business School. Whittemore has been active in the Columbia Business School Alumni Club of New York’s Membership Committee since 2002 and as chairwoman of the Greeters Subcommittee since 2004. In that role, she coordinates greeters for club events with the goal of ensuring peace-of-mind for the event organizer, a welcoming presence for event attendees and total focus for the event presenter. "Christine has been a valuable leader at the CBSAC/NY overseeing the Greeters Committee flawlessly," according to Todd Rubsamen, retiring President of the CBS AC/NY who recruited Christine. "After 5 years valuable contribution to the Columbia Alumni network it was gratifying to see the Board's Nomination Committee recognize Christine's hard work and judgment by select her from the 16,000 Columbia Business School Alums in the NY Tri-Sate area." Directors of the CBS AC/NY have a fiduciary responsibility to oversee the proper management of the New York alumni club, established in 1975 in recognition that Columbia Business School graduates spend more time as alumni than they do as students. The club’s mission is to strengthen the alumni network and be a positive and valuable resource to the alumni of the Columbia Business School. The board of directors also selects the club executive committee, consisting of two co-presidents, treasurer and corporate secretary. For more information about the Columbia Business School Alumni Club of New York, visit http://www.cbsacny.org. The Columbia Business School Alumni Club of New York (CBS AC/NY), founded for alumni and by alumni in 1975, acts as a unique educational, business, and social resource for all Columbia Business School graduates, students and faculty in New York and the surrounding tri-state region. For more information, visit http://www.cbsacny.org.